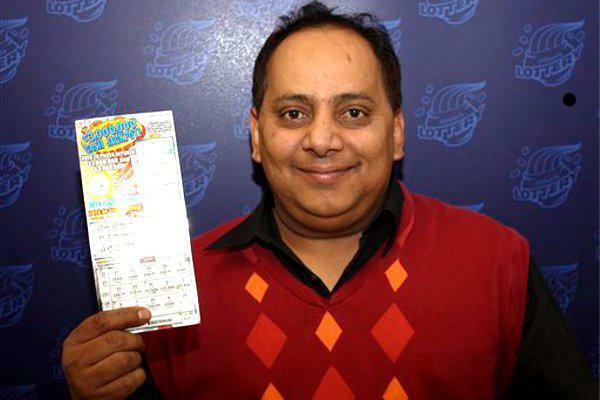 Chicago, IL- Urooj Khan, business owner and self-professed lottery junkie finally hit it big. He won a cool Mill on a scratch- off ticket after a recent pilgrimage. The day after his check was issued, which was a lump sum payment after taxes- Khan was dead. Double scratch. Standing next to his wife and jumping for joy- Urooj, in the US for 12 years, committed to sharing his windfall with infirmed children- a noble and altruistic choice. Non-citizens of the US may participate in state lottery. Urooj recently returned from a Muslim pilgrimage to Saudi Arabia where he swore off gambling for a few weeks. After several requests from Khan’s family, further toxicology testing has determined that his death was no accident, and he died from cyanide poisoning. Khan’s initial examination at the scene was thought to be hardening of his arteries although no autopsy was preformed at that time. Urooj Khan’s wife, Shabana Ansari was not deterred by her grief. She cashed the check in her husband’s name on August 15th as the legal recipient of his estate and promptly wrote a check to the closest children’s hospital. Of course she did not, you know snark when you see it and this woman is insulting your intelligence as a follower of true crime cases involving idiots with access to biohazards. Paging Carrie Matheson.. Consult please. The investigation into the death of Urooj Khan continues. Yep…I thought it strange to drop dead after having won the lottery. I told my husband “I’ll bet the wife did it”. Is wife still in the country? The other day I mentioned how I’d hate to be dating these days. For goodness sake, I’d never want to win a lottery. Operative clue is that he drops dead after the check it cut- only one person would know that and create a trail to the request or confirmation. Miss Stoy- first time reader but wanted to compliment you on your writing. Very Huff-esque and respectful to the subject matter, a victim of homicide. It was one of the most memorable exchanges in my classes of 30 years. Carry on because you were meant to do this work. You taught me and for that I am grateful. Did he have an attorney that was handling the cashing in for him? Or a financial advisor? SNARK!! SNARK!! Loved the ‘childrens hospital’ line. And, yeah…she’s not the sharpest tool in the shed is she?? lol, I want to know exactly one thing- where is someone getting cyanide- you know who has to be involved in this now- and should be. Remind me if I win the lottery to have my attorney go and collect the check and make the deposit for me in a trust account so that my ‘loving’ relatives can’t find out about it until it is secured… Yikes… what greed will do. Well, the muslim women may have a tough life with little respect, but sometimes they get even in a big way. A sudden hardening of the arteries. Wow, this crime scene guy or girl is really educated. Lol. I appreciate the compliment but as I have spent months working on a major investigative piece I am still working through and I put this out in 10 minutes, well, ya know. People amaze me in 2013 that they think they can get away with this- and ALMOST do. I mean..I know all of us follow crime investigations and what not, but why do people think they can do things and not get caught?? That still amazes me. Curiousity killed the cat, satisfaction brought him back…Blink, will we be introduced to the investigative piece you’re working on anytime soon? I hope so, my goal is in the next 2 weeks. Blink, I’m sure you know, DJ got himself a true bill in Coffee County on the gun charge. Just making sure you knew. Thank you, I did, Kelly posted it on my FB. I appreciate you updating here. OT … But we all need to read some good news. After 19 years this man will be re-united with his mother. Richard Landers Jr was abducted by his paternal grandparents when he was just 5 y/o. He’s now a 24 year old married man whose wife is expecting their first child. His mother is ecstatic as would be expected. Not seeing or knowing anything about her little 5 y/o boy for the past 19 years. If he’d have been cremated,there would have been no way to check on what had killed him.. So who did the funeral arrangments? John Wayne Gacy search…possible externment–is that the word for excavating bodies, heinously buried? This guy is a muslim. In their sect, they must be buried immediately and the body is not cremated. If the coroner or ME determined the cause of death to be something other than natural causes, the body would have been held. There now appears to have been some type of family problem. Did the wife do it or did someone else? JUh oh…curry is spicy and might have truly masked the taste and smell of the cyanide. The wife and stepdaughter did not eat any of it according to several accounts….but then Hansari said that all ate together. Mr. Khan’s death causes infighting almost immediately and Khan’s daugter becomes custody of one of his sister’s. Now the body will be exhumed for further testing. Can’t find that particular poison would be used in Dry cleaning…but I know it can be made. Wife is quite younger than he was…..hm…. Seems like the wife did it! I wonder if he had a gambling problem?